Historically mining has long been a vital industry in Wales. At one time the area around nearby Llanelli produced around half the worlds Tinplate. Kidwelly Industrial Museum, a short fifteen-minute drive from Bryn Iltydd along the A484, provides a fascinating look back at Wales past. Admission is free. The Parc Howard Museum in nearby Llanelli is a gentile house with gardens and a tearoom. The museum itself exhibits local crafts such as Llanelly pottery as well as other artefacts from the regions history. 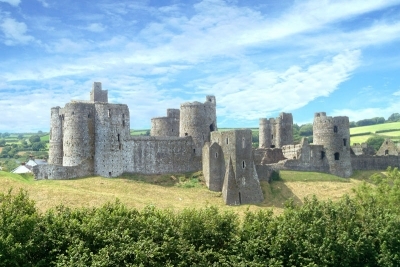 Kidwelly Castle is a well-preserved Norman castle, part of a series of strongholds made to secure Norman rule around the coast of Wales. Built on a hill it affords brilliant views of the surrounding countryside. The town of Burry Port has many local high street shops and independent retailers, but if you are looking for a more immersive shopping experience Swanseas Quadrant Shopping Centre is one of the largest for miles around. Hurrens Inn on The Estuary has some great views of the river mouth, fine food, good service, and it is only 20 minutes drive along the A484.